I’m sure, like me, by now you’ve seen this gracing your facebook page. And, maybe, like me, you chuckled a bit the first time you saw it. But then, I stopped. And I thought about it for a moment. When I started this blog, I set out to keep it a safe place, with no judgments. And that’s kind of when it hit me. This is what bothered me about this. Yeah, yeah, we’ve heard it before. And our generation kind of disagrees. There’s a population of parents who feel that their children will be tied down with chores for the rest of their lives, so they don’t need to start at age 5. Some feel that they should contribute to the household duties as soon as they are physically capable. Full disclosure, I was doing my own laundry and cleaning the house by the time I was my kids’ age, so you’d think I would follow suit having my own kids do the same. My kids make their beds every day. They are expected to tidy up their spaces, sometimes they need more coaxing to do so, but they do it. SOmetimes they set and clear the table for meals. They do not do the laundry. They do not wash the counters or the floors. And it’s because my boy really can’t. I mean, he is physically capable of doing it, but he does not have the capacity to either well, or in a way that it won’t, most likely, have to be fixed by one of us anyway. Oh, and another thing. I don’t feel it at all necessary to burden his already overwhelmed, overly sensititized brain to MORE things that he HAS to do. He HAS to do school work. He HAS to go to football or basketball practice. He HAS to stay for extra help after school a couple of days a week. He HAS to study for the onslaught of quizzes he has every week. He HAS to go the psychologist once a week to work on his anxiety. These are the things he has to do. And he needs downtime. I was talking to my husband the other day and said that I don’t know if I want J to go to public high school if it means that he is going to have to spend all of his time working to catch up to his peers with school work, and no time figuring out who he is or what makes him tick. You see studies, or other judgy facebook posts, explaining the importance of down time. I KNOW my kid needs downtime. So much so, that it is built into his daily schedule. Sensory breaks, is really what they should be called. And, the thing is, my neurotypical daughter needs them too. Every kid needs them. Every kids needs time to take a break from their daily obligations. As adults, don’t we need them too. Don’t we take time for ourselves several times a day surfing the interwebs, looking through our Facebook or Twitter feeds, checking our favorite news sources?? We build downtime into our schedules but don’t think our kids deserve them too? 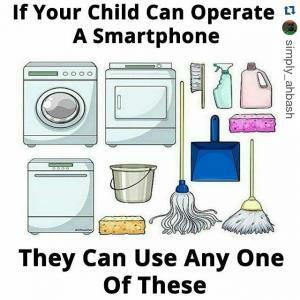 So, my thing with this picture is not that I don’t think my kids should lend a hand around the house, but that they should help out, and they should still be kids. If that means riding their bikes, playing basketball, skipping rope, or watching YouTube for half an hour, I’m okay with that. If it means that they can face their days and the huge weight that it is to be a student these days, I’m okay with that. If it means that I am giving them a shot at being a functioning member of society one day, and going to college and falling in love and living independently, than I’m good. They will do their own laundry when they need clean clothes and don’t want to wait for once a week when I do it. They will clean the floor, when they accidentally spill some drink they weren’t supposed to have, and I call to say I am on my way home. In a panic, in a pinch, it’s amazing how things work themselves out. And I won’t judge you or your kid either because I don’t know your story. I don’t need to know why you choose to raise your child one way, and maybe I raise mine another. As long as you are good people, I’m good with you. If your kids can’t separate the lights from the darks, I think they’re probably still ok.